Find Brother Balatin on a pyramid in the Wizard Spires in the Dreadlands. You must have an enchanter mesmerize him for he considers KoS to everybody. When he is mesmerized he will consider threateningly but will still talk to you and accept the quest items. Brother Balatin turns to you. A transparent human face materalizes upon the skull. As he speaks the smell of rotted rat corpses rushes into your face. You must fight the urge to vomit. What discipline do you follow? Brother Balatin says 'Then we are one. The rebirth of our circle shall start with you. I have waited decades for your arrival. You should seek the living brothers within Tunaria. When you have earned your garb then you will be ready for the true drape. Brother Balatin says 'Seek the broken flute of our master. Taken from us by the Iksar twins of Vistrei. To me they will come and to me your robe and to you will come the dawning of the new brotherhood. You will need the Robe of the Lost Circle and and two metal pipes. The first metal pipe is found off of an Iksar Betrayer in Chardok. He is level 53 monk and spawns in two places. The first place is in the catacombs under all the bridges. He will wander under there and sometimes toward the fort. Also, if you levitate up the tunnel near the exit there is a little piece of ground with three wanderers. One of these is his placeholder. He will drop a metal pipe which identifies as Fi. The second metal pipe is found off of a Drolvarg Pawduster within Karnor's Castle. He spawns in the Drolvarg Warlord room which is very deep into the castle. From the jail move past the five doors to a set of stairs at the end. Go down the stairs and open the door. Inside is a small room containing 4 spawn points. This is the Drolvarg Warlord room. From the Pawduster's corpse you will find a metal pipe that indentifies as Zan. 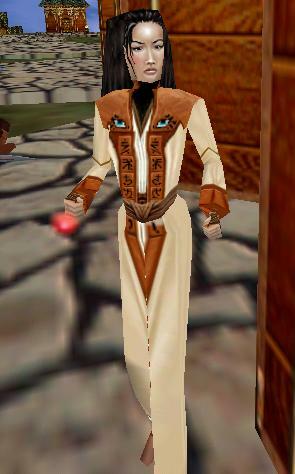 Hand the Robe of the Lost Circle along with the two metal pipes to Balatin and you will receive the Robe of the Whistling Fists.